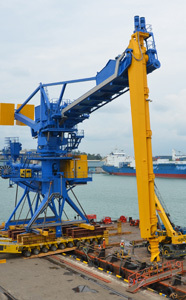 Al Jaber Heavy Lift, a member of the Al Jaber Group, specialises in the full range of lifting and transportation services onshore and offshore from hire and trip basis to the execution of totally engineered and managed “factory to foundation” projects comprising marine transportation, overland transportation and erection of cargo at site. Our objective is to consistently provide our clients with safe, comprehensive, high quality, engineered heavy lifting and transportation solutions onshore and offshore which meet world class standards. Therefore, we place great emphasis on understanding and supporting our clients through personal contact and assistance in the planning of our services to achieve the best possible solution and the most cost effective, safe handling of their goods. We believe that the successful implementation of our high professional standards largely depends upon our ability to anticipate even the smallest details in the operations. The operations are executed by our teams of highly experienced and motivated personnel whose technical expertise guarantees the quality of our service. Emphasis is placed upon the adherence to our homogenous and comprehensive documentation and procedures to ensure that our standards of safety, engineering, quality and training are implemented and maintained at the highest standards.